As Google suffers a catastrophic nose-dive in its market value, analysts are already predicting its demise as the world’s lead Internet search engine. ‘[Google] could disappear in five to eight years and disappear in the sense that Yahoo used to be the king of search,’ said Eric Jackson, the founder and managing member of Ironfire Capital, a technology-focused hedge fund. ‘Now, for all intents and purposes, Yahoo has disappeared,’ he said on CNBCFriday. Google’s stock value plunged a hair-raising 10 percent this week — wiping out more than $24 billion from the company’s value — after its third-quarter earnings report, which revealed a 20 percent drop in profits over last year, was accidentally released three hours earlier than planned on Thursday. The profit losses were driven by a decline in advertising revenue, according to its earnings report. The amount that advertisers paid Google on a click-per-click basis fell 15 percent. Advertising revenues are falling — and will continue to fall — for Internet companies because consumers are increasingly migrating to mobile applications and advertisers aren’t willing to pay as much for a mobile ad. Advertisers aren’t willing to pay as much for mobile advertising because the platform is not as effective as advertising on a desktop or laptop computer, analysts said. Other companies, such as Apple, will get ahead of Google in attracting advertisers to their mobile applications and Google’s dominance will eventually start to shrink, Jackson predicted. For now however, despite its drop in earnings, Google remains dominant in online advertising with a 74.5 percent share of the U.S. search ad market, according to data from eMarketer. Shares in Apple, the only technology company larger than Google in market value, fell by around 2.8 per cent during trading on Friday. Facebook, which is another technology stock heavily dependent on advertising for its revenues, saw its shares fall by 0.5 per cent during trading. The Dow Jones index of trading on Wall Street dipped more than 200 points. Google blamed its printers for releasing the results by accident. 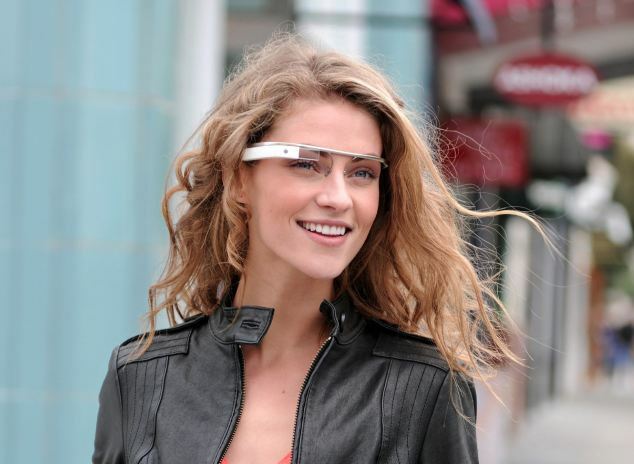 Speculation was mounting on Friday night that Google could make a legal claim against R.R. Donnelley, the company it pays to put out its financial results. It was quickly obvious that a mistake had been made – the second paragraph of the filing said ‘PENDING LARRY QUOTE’ instead of an actual quote from Google CEO Larry Page – but it was not clear why. The company could have a negligence claim to recover any additional costs it incurred in responding to the incident, according to Reed Kathrein at U.S. law firm Hagens Berman. But any shareholders looking to recoup lost investments would not have a legal case because there was ‘no fraudulent intent’ in the early release, he added. Google’s troubles were shared by the markets as a whole – the Nasdaq market of technology stocks fell by more than two per cent, while the Dow Jones index was down 1.5 per cent. The contagion also spread to Europe, with Britain’s FTSE 100 closing 0.3 per cent lower and the leading French and German markets both down nearly one per cent. Google later said on its blog that Donnelley had filed a draft of the document without authorization. Respected financier David Buik, who has studied the stock markets for 50 years and works for investment firm Cantor Index, said: ‘Nothing has ever come remotely close to this. 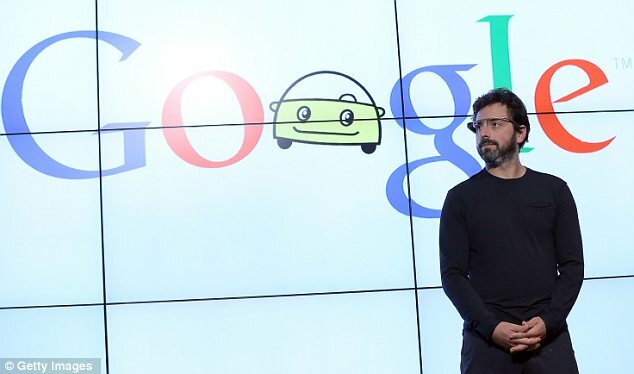 Trading in Google stock was halted when its shares fell by nine per cent in just eight minutes following the release of its disappointing earnings report. Analyst at GFT Markets Fawad Razaqzada, told Mail Online: ‘The closing price was around $695 a share – the last time it was this low was as recently as September 13. So, assuming a shareholder had bought before this date they would still be in profit. WHY WAS SO RELEASE OF THE RESULTS EARLY SUCH A DISASTER? There’s an old saying that markets don’t like surprises, and negative results being published early is a prime example. Even though the statistics are bad for Google whenever they are published, the early release did not give the internet giant the opportunity to explain why the figures were so disappointing or manage market expectations. Usually earnings reports come with a numerous conference calls and briefings between the firm’s management and investors, traders and journalists to give content to the figures an reassure the markets. Without the briefings, the numbers are left to speak for themselves. The plunge prompted worries that a second dot.com crash could be on the way. Google’s troubles coincided with a steady fall in Facebook’s share price and the ongoing struggles of newer start-ups such as Groupon and Zynga. Tech industry experts warned that the stark fall in advertising rates could hit other Internet giants. ‘It was just too rapid a deceleration,’ said Brian Wieser, an analyst at Pivotal Research Group commenting on Google. The Google disaster came as Mark Zuckerberg openly acknowledged last month that Facebook’s stock market launch damaged the company’s image. One of the mistakes that Zuckerberg pointed out was that Facebook spent too long focusing on their HTML platform for the web as opposed to adapting and improving the product for mobile devices which he now firmly believes is the future of the network. He said that they underestimated ‘how fundamentally good mobile is’ for their growth. R.R. Donnelley has become the world’s large commercial printer in the last two decades, having bought up a string of other businesses. The Chicago-based firm has published Penguin Classics and paperbacks from the Twilight vampire series as well as the best-selling Idiot’s Guide books. Google issued a statement blaming Donnelley, its filing agent, after the Internet search company’s quarterly results were released by the U.S. Securities and Exchange Commission hours ahead of schedule. 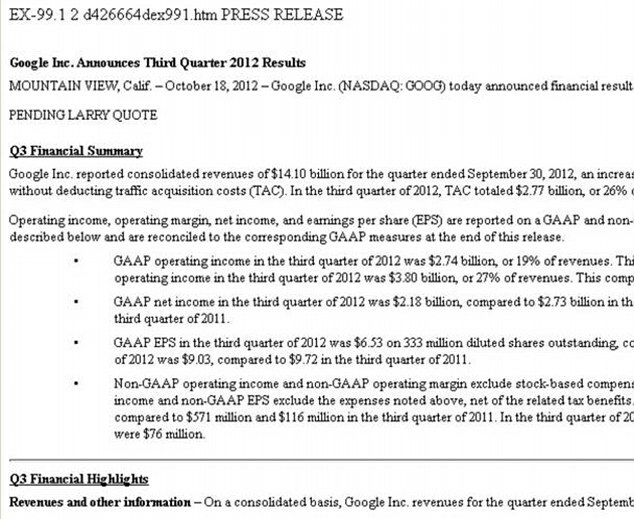 Donnelley shares lost more than 5 percent after Google started pointing the finger. The company did not respond to a call for comment, but issued a statement to CNBC in which it said it was investigating the circumstances of the release. Best known as a provider of printing services, Donnelley is also the top SEC filing agent in the country, handling more than 75,000 submissions this year as of mid-October, according to SECInfo.com. Filing agents like Donnelley take paper documents and convert them for submission to the SEC in the appropriate format. The company also owns the filing portal EDGAR Online. It ranks 249 in the list of Fortune 500 of America’s largest corporations with about 58,000 employees. ‘Everyone is trying to figure out if there’s any legal issue with respect to R.R. Donnelley. Google is halted, Donnelley is down big-time on the news since they’re allegedly not supposed to have released the information,” said Michael Matousek, senior trader at U.S. Global Investors in San Antonio. But one plaintiffs lawyer who sues companies on behalf of investors said shareholders would not have a claim against either Google or R.R. Donnelley because the earnings disclosure was likely a mistake. ‘There’s no fraudulent intent here,’ said Reed Kathrein with Hagens Berman. R.R. Donnelley may not be entirely off the hook with Google, however. The company could have a negligence claim to recover any additional costs it incurred in responding to the incident, Kathrein said. Any potential damages against R.R. Donnelley could be limited, though, by the contract between the two companies. Analysts blamed the poor performance by Google on its $12.5billion (£8billion) acquisition of Motorola, the struggling cellphone manufacturer which has been left behind by its more fashionable rivals. Another problem for the company, which is overwhelmingly reliant on search-based advertising for its revenue, is that advertisers have slashed payments to the search giant as consumers turn towards mobile devices. ‘The core business seems to have slowed down pretty significantly, which is shocking. I don’t think anybody saw this,’ said Sameet Sinha, analyst at B Riley. ‘The only conclusion l can look at is – search is happening more and more outside of Google, meaning people are searching more through apps than through Google search. That could indicate a secular change, especially when it comes to e-commerce searches. He told MailOnline: ‘Around 95 per cent of Google’s income comes from its advertising services, and while many big brands are maintaining their budgets and are being aggressive to win new customers in the current economic climate, a large proportion of the search engine’s advertisers are small businesses who are more exposed. But Mr Buchan insisted that such a ubiquitous company would recover eventually: ‘Bing might be dreaming otherwise, but this is nothing more than a blip. Google’s third-quarter profits fell 20 per cent on a year earlier to $2.18billion (£1.35billion) – well below analysts’ expectations. The dire results were due to be issued after the markets had finished trading for the day. But because they were released early, investors were able to dump their stock and send the shares into a nosedive. 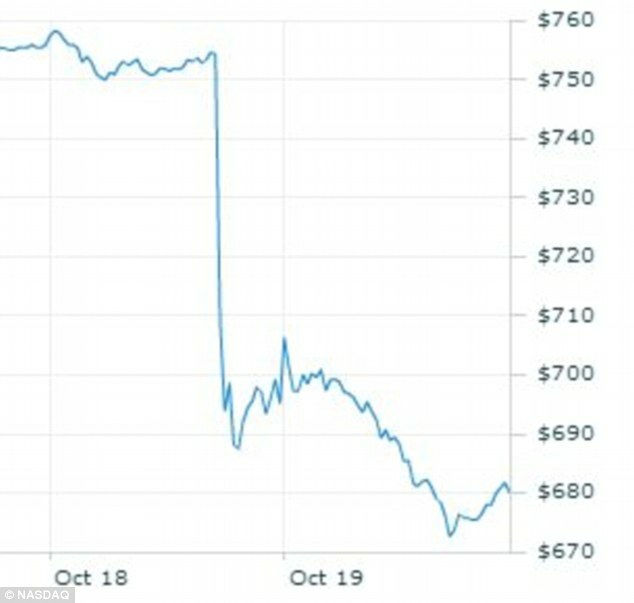 Adding to the chaos, a major trading website appeared to have crashed as investors sought to make sense of the situation. Google’s stock fell $68.19, or nine per cent, to $687.30 before trading was halted to give shareholders a chance to digest the news amid fears of a massive crash. The firm was losing more than $45 million for every second it was being traded before the shutdown, which was requested by Google itself. It is unclear how much of the plunge was attributable to the surprise leak of the report, as the exceptionally poor results would almost certainly have triggered some fall in the firm’s value. When trading reopened around two hours later, the share price failed to recover significantly, crawling up one percentage point to $695.00. The fiasco brings to an end an incredible growth story that has seen the company’s worth balloon to become the most valuable technology firm after iPhone maker Apple.The company did not explain why its earnings had been so disappointing. The report comes at a crucial juncture for Google, which is preparing to embark on a number of high-profile new projects such as Google Glass, a tiny computer fitted to a pair of spectacles, and the $250 Chromebook laptop which was released today. The stock market disaster overshadowed the Chromebook launch in San Francisco with several reporters running out of the event to cover what had happened. 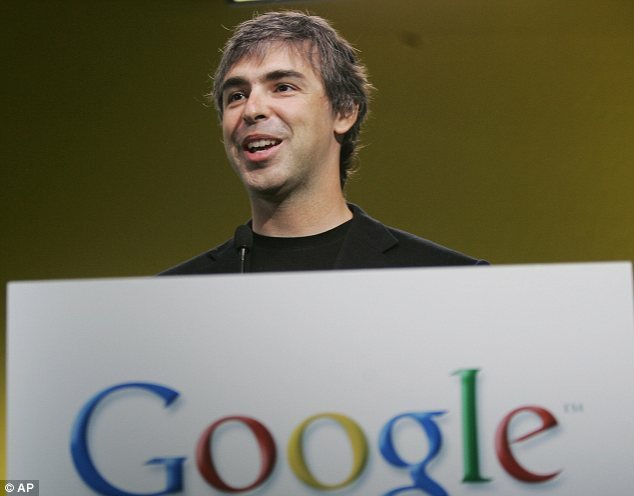 Google’s earnings report had been scheduled for release at 4.30pm on Thursday, after the end of regular trading. The PENDING LARRY QUOTE’ at the beginning of the premature press release, quickly went viral. It became a hashtag on Twitter as jokes ran riot, along with #google and #oops. Adding to an appalling day for the company, YouTube, the video-sharing site owned by Google, appeared to crash completely for several minutes on Thursday afternoon. The main reason for Google’s fall in profits is its $12.5billion purchase of Motorola, the struggling cellphone manufacturer. The division lost more than $500million over the quarter, prompting aggressive cost-cutting measures. However, the web giant is also suffering in its core business, search-related advertising, as the income received for every ad clicked on fell by 15 per cent in just three months. The future may be no brighter for the firm, as it is set to plow millions into new ventures such as virtual-reality glasses and driverless cars. And some analysts have predicted a bleak outlook as web users turn away from Google and start using alternative search methods such as Facebooks and mobile apps. Mr Page later issued a comment arguing that the company had enjoyed ‘a strong quarter’, adding: ‘We had a strong quarter. Revenue was up 45 percent year-on-year, and, at just fourteen years old, we cleared our first $14billion revenue quarter. Google issued a statement blaming R.R. Donnelley, the Chicago-based company that prints its financial documents, for the early release. 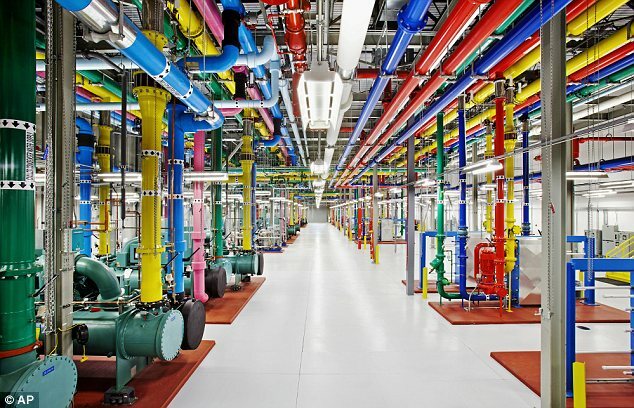 ‘Earlier this morning RR Donnelley, the financial printer, informed us that they had filed our draft 8-K earnings statement without authorization,’ the Google statement read. Donnelley’s shares fell by more than five per cent following the blunder as the firm blamed its screw-up on ‘human error’ and promised to launch an investigation to ‘determine how this event took place’. Reed Kathrein, of law firm Hagens Berman, said Google could have a negligence claim against Donnelley to recover any costs it sustained in the incident. The Chicago-based firm has printed Penguin Classics and paperbacks from the Twilight vampire series as well as the best-selling Idiot’s Guide books. Over the past two decades, it has bought up a string of other firms to become the world’s largest commercial printer. On its website, Donnelley boasts of working with more than 60,000 customers worldwide ‘to develop custom communications solutions that reduce costs, drive top line growth, enhance ROI and ensure compliance’. R.R. Donnelley also reported a downturn in business earlier this year as more readers chose digitial devices over books. 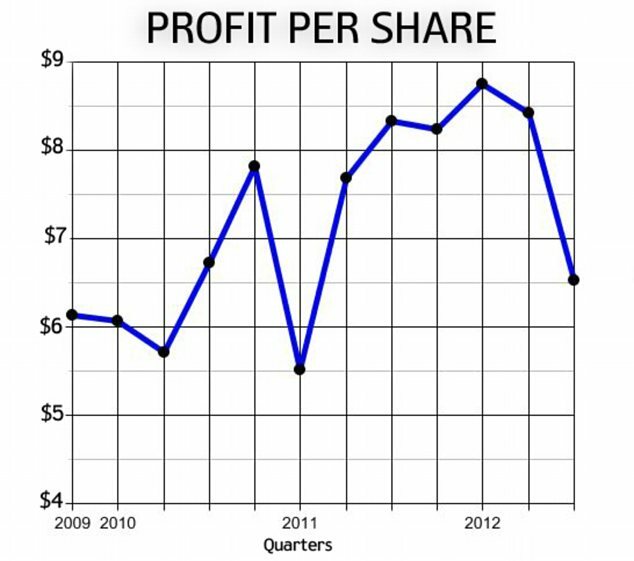 It has closed plants and laid off workers but share prices have slumped since 2007. Between May 31, 2011 and February stocked dropped from $21.34 to $11.25. In a regulatory filing, Google said it earned $2.18billion, or $6.53 per share, during the three months ending in September. That compared with net income of $2.73billion, or $8.33 per share, last year. The earnings would have been $9.03 per share, if not for Google’s accounting costs for employee stock compensation and restructuring charges related to the acquisition of Motorola. Google’s filings with the Securities & Exchange Commission also revealed a worrying drop in the amount of money the technology giant receives for each advert users click on its websites. Its average income per click fell 15 per cent over the three months to the end of September, sparking fears that it is losing traction with advertisers. The slowly growth in ad revenue is driven by the growing use of smartphones and tablet computers to access the internet. The ads are more difficult to see on smartphones, in particular, so marketers are not willing to pay as much for those commercial messages as they do for ads that are seen by people on personal computers.